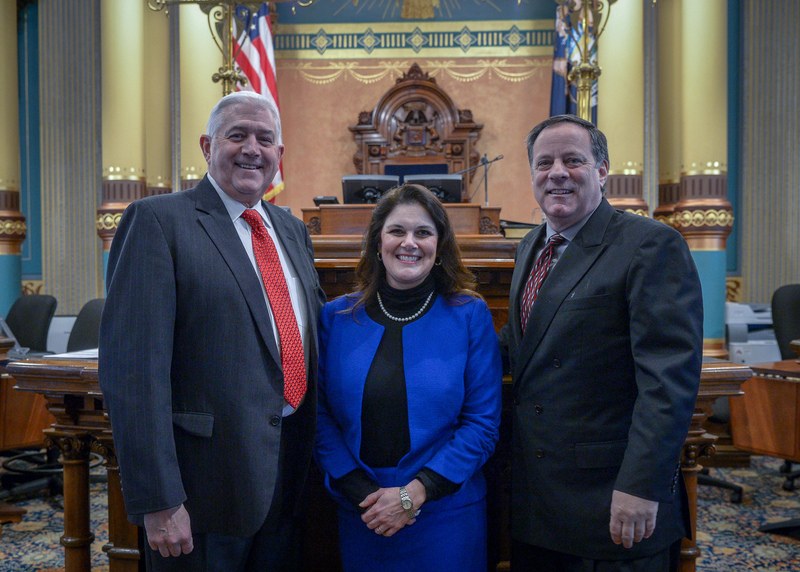 LANSING, Mich. — State Sen. Ken Horn, R-Frankenmuth, welcomed Dr. Stephanie Duggan as his guest for Gov. Gretchen Whitmer’s 2019 State of the State address Tuesday. Duggan serves as regional president of Ascension Michigan’s Northern Ministries, which includes St. Mary’s of Michigan in Saginaw and Standish, and St. Joseph Health System in Tawas. Editor’s note: A print-quality version of the above photograph is available by clicking on the image or by visiting the senator’s website at www.SenatorKenHorn.com. Click on “Photos” under the “In the News” tab. Photo Caption: State Sen. Ken Horn, R-Frankenmuth, is joined by Dr. Stephanie Duggan and her husband Jim on the Senate floor prior to Gov. Gretchen Whitmer’s 2019 State of the State address.